dbr wrote: Where are you going with this Fred, is this supposed to arrive at "nobody has any rights so the players should just shut up and accept whatever the owners want to pay them"? Indeed. It sounds like you're arguing (if you are arguing.. ) against what you think I think. vic wrote: Can someone explain to me what the difference is between escrow and a roll-back? However I could be wrong so don't quote me. ukcanuck wrote: You have to question the term HRR because you can drive a bus through that potential loophole. HRR was defined in Article 50 of the recently expired CBA. A definition signed onto by both the league and the NHLPA. Escrow for the first quarter or so a season is set based on the previous seasons revenues, some early prognostication of revenue increases (i.e. known ones such as increasing TC contracts) and the amount due players. This tends to be a higher than normal amount. As the season progresses and they get a better read on what revenues are going to do the escrow percentage is adjusted accordingly. For this past CBA that means that as the season progressed escrow holdings from paycheques likely dropped (as revenues increased). One thing fans need to keep in mind when listening to the union about the league funding revenue sharing off the players back (i.e. escrow) is that just because the paper contract says $X that isn't what wholly matters. The other piece is fixed percentage of HRR they get (57% this past year, no more and no less). What that means is IF money goes back to the owners/league from escrow at the end of the season it is because THAT MONEY NEVER BELONGED TO THE PLAYER IN THE FIRST PLACE. The players ratified the CBA that said as much and profited greatly over the course of the CBA...it has nothing to do with fair or not it has to do with that's what it is. But really the last CBA was more than fair for the players. The players actually do their brethren a bit of a disservice when they sign big front loaded deals with huge signing bonuses as the HRR %age is calculated based on what is actually paid (not salary cap). Also the league's last offers for %HRR have been around the 49% mark for the first year let's not exaggerate and say 42 or 47%. And yes it makes a difference as if revenues grow in the first year the next drop down to 47% may not be a drop at all. Heck that 49% may not even be a drop to the total salary pool. And of course those were not tak eit or leave it numbers to begin with. Note: I talked to a friend in the Flames organization and his belief based on what the ownership group is saying privately is that this will be a long lockout as the PA has decided to play games instead of look at reality. From another board I was reminded that one person who Goodenow relied on for advice in 2004 was Fehr who suggested the owners would never shut down the season. It'll be interesting to see if Goodenow can keep 700 players in line for longer than a quarter of the season. I don't think he can as the bulk of players know that this type of CBA is not some sort of abuse. ukcanuck wrote: I think you are right about not blinking till the first paycheque, which is Oct 15th I think. If they go past there (PA,) I think we are in for a loong lock out. It doesn't make any sense to fold after losing what would amount to a roll back anyway. Truth is "holding out" doesn't make any sense "at all" for the players, that's the whole problem. By missing just 20 games they end up taking the the full 24% roll back that the owners asked for in their first offer. The owners don't make any money over the first 20 games anyway (other then NYR, Van, Tor, and MTL). I do think the owners will make their best offer after around 20 games but it will still be an offer that sees the players share reduced over time. Kind of a crappy situation for the players, it would be far better to try and get something similar by mid October so they don't lose any pay. ukcanuck wrote: What about the revenue from concerts held in Roger's Arena that wouldn't exist if it weren't for the Canucks and the players that we all pay to watch? You are off your rocker if you think revenue from a concert at GM place should count as hockey related revenue. Not sure what your point is on branded hats and shirts, of course all of that counts. As for Betman and his Lawyers "hiding money", given the PA has full audit rights, I would suggest that your statement is highly speculative. tantalum wrote: What that means is IF money goes back to the owners/league from escrow at the end of the season it is because THAT MONEY NEVER BELONGED TO THE PLAYER IN THE FIRST PLACE. Tant, thanks for posting that so clearly. It is a point that many don't get and one the PA tries to exploit in their PR. Topper wrote: Tant, thanks for posting that so clearly. It is a point that many don't get and one the PA tries to exploit in their PR. Really I'm guessing they do it the way they do simply to reduce some accounting load and unnecessary movement of money. It's money the teams have already paid out (to the escrow fund) there is no reason to return the money to each individual team, then ask for the revenue sharing tithe, and then distribute that revenue sharing money. Just use the fund to send the appropriate amounts of money where they need to go....30 transactions instead of, well, many more than 30. The "optics" (i struggle to call it optics...) of the other way are better, but hey that would be an unnecessary expense which in the end would hurt the PAs position if it were done that way. I'm beginning to think that some of the media that are speculating that the goal of the PA members that are really leading the charge really is Bettman's head on a platter (as the league got Goodenow's last time). I DON'T think that is Fehr's goal as I don't think he cares one way or the other. His goal is to read the union and owner solidarity and use it to as much of his advantage as he can to get the best deal and ultimately take his direction from the players. He can't lose sight of his responsibility though and let that drive for Bettman's head among members of the PA cloud over what may be the best deal they are going to get. He has to be able to recommend what might be an unpopular deal. i don't believe the league is after Fehr's head despite his behind the scenes stuff last time around....but I think that may very well change if the PA continues to get more militant. Note that as I mentioned before I don't believe there is a personal Fehr vs Bettman element in this like there was Goodenow vs Bettman. Due to that the drive of certain factions to end Bettman or Fehr can be curbed signigifacntly. Kepp in mind this ideologically bankrupt person has fully supported unions in the past. When the Yale service workers went on strike in 2003 while I was working there I supported them. It made little sense in my mind why Yale with the multi multi multi billion dollar endowment was being so militant over a marginal hourly wage increase and bringing pensions of 20+ year employees up over the poverty line. However, I didn't quite support the numbers the union was looking for (70+% increase if I recall. Yale had offered 10% or so increase on pensions (I honestly can't remember what the settlement was). Where every other business carries on operations while a new labour agreement is being negotiated, with both labour and management rightly regarding a strike or lockout as the absolute last resort, Bettman and his chief labour strategist, outside counsel Bob Batterman, rush to lock the doors. As Ansar Khan of MichiganLive.com noted, the NHL has now lost 1,698 regular-season games due to labour disputes since 1992. That is more than Major League Baseball (938), the NBA (504) and the NFL (0) combined. The players suggested to play while negotiating, but Buttman won't of course have any of that. Love of the game? Does he even know what that means? It's been said over and over again on various boards that owners in North American pro sports leagues will never ever again carry on without a CBA in place. They will always lock out the players. Every league. Every time. Why? Because the guy heading the NHLPA right now led the baseball players on a strike that cancelled the playoffs and world series in 1994. No league will ever trust the union to negotiate in good faith and not use the playoffs or other premiere events as leverage...especially a union led by Fehr. It would be nice of course but that hope died in 1994 not due to uber-rich owners but a union. Given Fehr's history, the owners would be out of their minds to play out the season with no agreement in place. We all know if the owners agreed to play under the existing CBA until a new deal is reached there would be no new deal. The players love this CBA, the one they lost a season protesting. The Owners hate it, the one they lost a season ramming down the players throats. Funny how that works. I hate the lockout but it is the only way to force the issue with the NHLPA. Maybe next time the PA will work harder in trying to get a new deal before the old one expires. There is no excuse, on either side, for the failure to negotiate in good faith commencing a year ago, two years ago. And I'm sorry the players feel that the owners want to ram something down their throats and that it's a partnership. BS, it is not a partnership and never will be. It is a business run by business men who are in business to make as much money as they can. I hate that banks make me pay for the privileged of having my money, and then charge me more to get my money out of the bank. I hate that condo prices are controlled and over inflated, I hate paying taxes. I that Trudeau came out with a wage and price freeze and after prices went up wages never did at the same rate. I hate that in all my working years I never once had a chance to "negotiate" and had to settle for whatever my boss gave me, often nothing. I hate that companies can close their doors, steal pensions and send jobs elsewhere all to increase profits. I don't hate unions. They have value and are still relevant. But I hate how unions feel they deserve more than the average person, well except politicians, who I really hate. I get what the players are saying but they live in a bubble if they don't see the reality here. Every employee can say the same thing, without our labour the bosses make squat. But we are all replaceable, even pro athletes. What I really dont get is, why, if the owners supposedly raped the players in the last CBA why isn't it still good enough for the owners now. They were the ones who brought it in and if the players are happy with it ,whats the f----ing problem? okcanuck wrote: What I really dont get is, why, if the owners supposedly raped the players in the last CBA why isn't it still good enough for the owners now. They were the ones who brought it in and if the players are happy with it ,whats the f----ing problem? Agreed but I think the deal had too many loop holes and allowed the players too high a percentage. Bettman has said they made mistakes. I think as others have pointed out the error last time was not in totally destroying the players will. Now they have seen how rich they have become in this system and don't want to let go. What bugs me and always will is that the owners need saving from themselves. Now they cannot collaborate but they can set internal caps and stick to it. The owners and the GM's do not have the will to make things work so they need a system. That is a problem. Hockey Widow wrote: We all know if the owners agreed to play under the existing CBA until a new deal is reached there would be no new deal. The players love this CBA, the one they lost a season protesting. The Owners hate it, the one they lost a season ramming down the players throats. Funny how that works. Lotta hate there HW, but I sympathise. That said, the owners have been looking at the PA as the easy button and their reasoning is hypocritical. They got cost certainty. They got a cap, and they still couldn't even fix the economics for the sunbelt teams. Sorry, but this is the owners' mess to clean up and the mop is called true revenue sharing. If the owners really believe Buttman's sunbelt mantra then put your money where your mouth is buckos and sustain those ugly sister teams until they ever get viable. How that's done is up for negotiation, but the ailing franchises are the problem, those same ailing franchises who are still signing players monopoly money deals driven by the FA market being driven up by the same teams whose owners don't want to fork over any cash. But somehow the onus is on the players to take a hit for the league? Gimme a break. 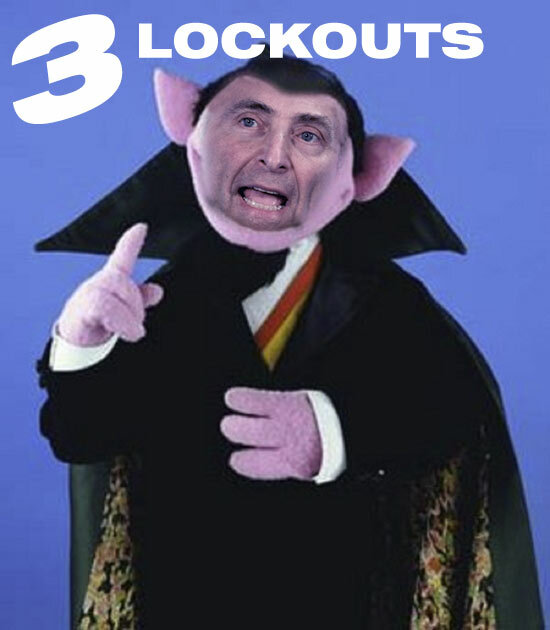 The way I see it, this lockout only benefits the Canucks. Give the guys some rest, let Kes rehab with no pressure, and by the time the season starts again in December, this team could very well be as prepared as it's been in the last couple of years.